This essay was presented by M. Berenyi at: Budapest, 1956 and Beyond: A Conference Dedicated to the History and Memory of the First Crisis of Communism (University of St. Petersburg, Russia, 2006). All conclusions presented are drawn from M. Berenyi’s field work and participation in the 1956 Memorial Oral History Project. The magnitude of new historical perspectives which may be garnered from the practice of Oral History is of an infinite nature. Through the prism of oral communication, Oral Historians extract, collect, and record data, ultimately destined to expand current perceptions and collected primary resources on a given subject matter. The practice of Oral History also enriches the discipline of History, yielding an opportunity to experience innate perspectives on human migration, cross-cultural experiences, and the process of resettlement. In celebration and memory of the 50th anniversary of the 1956 Hungarian emigration wave to Canada, the incentive to source new Oral History materials and expand upon existing Canadian Immigration History records sparked the interest of many. This paper will serve to inform the academic community, and other stakeholders, of the components and trends pertaining to the 1956 Hungarian Memorial Oral History Project, as recorded and experienced through the eyes of Oral Historian and Documentary Filmmaker, Monika Berenyi. The 1956 Hungarian Memorial Oral History Project was established in honour of the nearly 38,000 Hungarian refugees who arrived in Canada, between 1956 and 1958. The impact of the 1956 Hungarian Revolution and the mass of exodus of Hungarians who subsequently arrived in Canada forms a watershed moment in Canadian History. In the timeline of Canada’s short existence as a nation (federated in 1867), no other ethnic community group to date has equaled the number of persons associated with the 1956 Hungarian emigration cohort- all of whom were openly admitted and accepted into Canadian society within a two-year period. In October and November of 1956, Canadian public opinion polls revealed that Canadian society openly opposed the Soviet invasion of Hungary. Soon afterwards, the Canadian public rallied support for Hungary’s liberation, placing phenomenal pressure upon the Canadian Government to aid the Hungarian refugees in their plight for freedom and asylum. 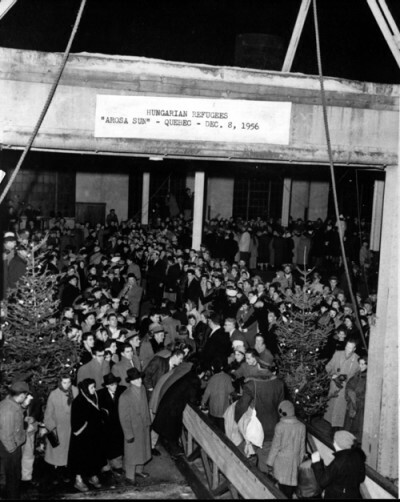 By November of 1956, the Canadian Government, supported by the assistance of the Royal Canadian Airforce Unit, responded with aid to the Hungarian refugee crisis in both Austria and the former Yugoslavia. In November of 1956, Canada, a nation of 16 million people, widely opened her doors to an “unlimited” number of Hungarian refugees, and simultaneously offered to bear all transportation costs. It is an internationally known fact that no other country in the world accepted more refugees per capita. Free transit was provided to the refugees via ship and aircraft. Although the vast majority of refugees arrived in Halifax and Quebec City, they later dispersed themselves throughout all of Canada’s 12 provinces. However, the most sizable numbers of Hungarian refugees settled in the cities of Toronto and Montreal. Of the 37,565 refugees who arrived between 1956-58, the majority of them were young, urban, and educated; a third of them were skilled workers and professionals; and men outnumbered woman by a ratio of 2:1. Furthermore, all religious groups, indigenous to Hungary (Roman Catholic, Greek Catholic, Calvinist-Presbyterian, and Jewish) were represented. The lasting effects of the 1956 emigration wave to Canada resulted in the formation and stabilization of many new social, cultural, religious, political, and educational institutions. Concurrently, the expression of new identities, built upon original belief systems and values, evolved within a uniquely Canadian context. It is the multiplicity of identities and the evolution of individual life experiences of the 1956 Hungarian emigration wave that captured the interest of Historians and Documentary Filmmakers associated with the University of Toronto, Multicultural History Society of Ontario, Oral History Museum of Canada, and Rakoczi Foundation. The 1956 Hungarian Memorial Oral History Project is held and administered by the Multicultural History Society of Ontario. The project encompasses content reflective of Canada’s broad geographic expanse, and is prided for its technological ingenuity. Resources are envisioned to be available in three official languages: Hungarian, English, and French. The core of the project lies in the construction and maintenance of a digital oral history archive, supported by digital oral testimonies, a digital photo archive, qualitative analytical files, literary collections, and other documentary materials. As a result of this extensive compilation of archival materials, the Multicultural History Society of Ontario now boasts Canada’s largest collection of materials which pertain to the study of Hungarian-Canadian communities. Furthermore, the growth and stabilization of this collection now provides for the development and support of new research and exhibition materials. Due to the posture of neutrality held by the Historians and community members who contributed to the compilation process of the 1956 Hungarian Memorial Oral History Project, the resources are of value to both Canadian and foreign scholars. Furthermore, the multifaceted depth of perspective yielded by the practice of Oral History provides opportunities for further scholarship in the broad fields of: History, Canadian Studies, Hungarian Studies, Social Studies, Linguistic Studies, Anthropology, Ethnography, Immigration Studies, and International Relations. The 1956 Hungarian Memorial Oral History Project is held by the Multicultural History Society of Ontario reference library, located at St. Michael’s College, University of Toronto. The Project is classified within the context of three major categories: oral testimonies; textual records; and ephemera. The Project is currently being digitized, and materials will be made available in the form of: an online database and navigable analog Collection. The goal of providing complete web-access to the Collection is projected for 2014. The opportunity to access rendered copies of the Collection (transcriptions, DVDs, and photo) will be at the discretion of the MHSO. Among the resources are substantial materials drawn from the Hungarian-Canadian diaspora of Hamilton, Ontario. These materials were documented and produced by Monika Berenyi. Hamilton, Ontario is an industrial city composed of 491,000 persons, and supported by the production of primary resources (steel industries). The speculated number of Hungarian-Canadians living in the vicinity of Hamilton, Ontario is 9,000. A case study was created by Berenyi, which provided a window into the social, cultural, economic, political, and religious trends associated with Hungarian refugees who settled in the vicinity of Hamilton, Ontario. In the backdrop of an industrial proletarian city, the case study served to investigate memory, resettlement patterns, the transference of cultural values, and the formation of new identities through the lens of Oral History. The case study was conducted within an independently developed framework, devised for the study and process of Oral History. Both the application of the framework and the recording of the Oral testimonies were subject to conditions in support of: qualitative analysis, the well-being of the interviewee, and the enabling of new historiography. The criteria of the framework was influenced by Berenyi’s personal interest in the disciplines of History, Ethnography, and Anthropology. The following sub-categories detail the framework of Berenyi’s specific research interests: Origins and Early Life; Catalyst for Migration; Migratory Processes; Emigration Processes; Settlement in New Homeland; Employment; Institutions of the Immigrant Community; Ethnic Identity in the Family, Community, and Country; and Relationship to Old Homeland. 1. Origins and Early Life: place of birth and nationality; size of town; village of origin; natural features of place of origin; ethnic composition of village; ownership of land or other property; occupations of family members; daily life (routine and folklore); social and religious activities; memory of the Great Depression; role of World War II; memory of the German and Russian occupations; conception of historic Hungary. 2. Catalyst for Migration: impact of Hungary’s defeat in WWII; role of male casualties on the Soviet front; economic crisis; political instability; hunger; Soviet occupation of 1945-49; establishment of official communist rule; terror; Kulakization; secret police (AVO); death of Josef Stalin (1953); events in Poznan, Poland (June of 1956); all events associated with the Hungarian Revolution of October, 1956. 3. Migratory Processes: local patterns of migration (seasonal, traditional); age and position in family at time of migration; social, political, economic status at time of migration; decisive reason for leaving homeland; role of agents, clergy, underground operations; general awareness of destination before leaving; knowledge of route; intended destination; intended length of stay; prospects of employment abroad; relatives situated in destination; method of transit on mainland Europe; cost; traveling alone or with companions; amount of money, goods, and papers taken; method and cost of transit to new homeland; experiences on voyage (Christmas, births, deaths, engagements, conditions); status at port of entry; location of port of entry. 4. Emigration Processes: life in transit; distance from point of entry to point of destination; knowledge of Canadian geographic landscape; personal status (single, married, children); method of transit to destination point; payment; explanation for chosen destination point; arrival at destination point; reception; integration; perspectives on Hungarian compatriots; perspectives on Canadians and Canadian society; sense of destination and location at time; general sense of transience or permanence; primary destination as permanent settlement versus frequent resettlement. i) Housing: location in city, town, rural area; boarding house, company house, single family dwelling, multi-family dwelling; proximity of co-nationals; cost of rent as percentage of pay at time of emigration; distance between housing and work; changes in housing; time of first property purchase. ii) Neighbourhood: description of core surroundings; ethnic institutions; other nationalities in settlement area; nearness to town centre. iii) People: relatives; community leaders; social, cultural, and religious institutions within community; typical characteristics of community. iv) Space: boundaries of community; focal points of community; landmarks; common meeting areas; geographic attributes of community space; common activities; common transit routes; modes of transit; usage of land; cost of living. v) Time: community maintenance and change in the past 50 years; knowledge of area; cultural specific events of interest in area; future of ethnic community in area; speculative descriptions of future generations. 6. Employment: first job; dissemination of information related to employment prospects; relationship between new job and existing experience; hours, pay, and regularity; issues of language; frequency of job change; sideline occupation; nature of work (outdoor, seasonal, factory, academic); method of transit to work; description of occupation (skill, lore, clientele, education); opportunities for advancement; discrimination and prejudices; stereotypical occupations; colleagues. i) Businesses: hotels; credit unions; food stores; restaurants; offices. ii) Community Leaders: entrepreneurs; religious institutions and clergy; consuls; doctors, lawyers, and intelligentsia; nature of new leadership. iii) Political Activities: trade unions; old world patriotism (historic Hungary); Canadian politics. iv) Social and Educational Institutions: Hungarian school system; scouting movement; folk dance ensembles; church-based organizations; benevolent societies; clubs; guilds. Family: details of marriage (monocultural versus multicultural, religion, location); financial management; child rearing practices and division of marital duties; expectations for children (marriage, cultural maintenance, education); family traditions and celebrations; sense of family identity and responsibility; food preparation; association with religious institutions; liturgical feast days; home décor; role of relatives and godparents; communication with old homeland; language spoken at home (parents, children, grandparents). Community and Country: language maintenance within community; persistence of community traditions (weddings, funerals, liturgical feast days, parish picnics); relationship with other immigrant groups; relationship with Canadian society; relationship between 1956 emigration wave and older/newer generations of Hungarian Canadians; community publications; awareness of political culture in old homeland; awareness of political culture in new homeland; dependency on religious community centers for definition of identity; role of federal institutions in supporting Hungarian-Canadian cultural identity. 9. Relationship to Old Homeland: role of old homeland in the formation of new identity; emotional attachment to old homeland; ability to conceptualize modern world view of an independent Hungary; legacy of the communist era; forms of communication maintained with old homeland; number of relatives still remaining in old homeland; frequency of travel to old homeland. In sum, the practice of Oral History is enhanced when a conceptual research framework is deployed by the Oral Historian. In reference to the 1956 Hungarian Memorial Oral History Project, a broad range of archival materials (inclusive of: oral testimonies, photographs, letters, diaries, essays, social club records, political organization records, church records, newspapers, and visual artworks) were collected at the intersection of a strategic research framework. This rich and varied Collection, punctuated by the practice of Oral History and use of advanced technology, now constitutes one of the most comprehensive and panoramic views into the 1956 Hungarian emigration wave to Canada. This rich Collection not only illustrates the value of the practice of Oral History, but offers a blueprint for success to future Canadian heritage collection projects. This entry was posted in 1956 Memorial Oral History Project on August 13, 2007 by mberenyi.